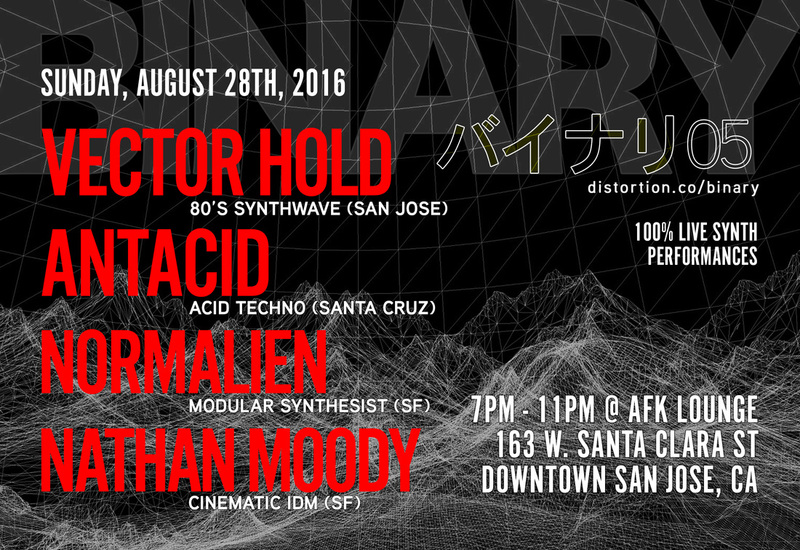 On Sunday, August 28th, BINARY SOCIETY 05 will showcase live performances from Silicon Valley hometown synthwave recording artist, VECTOR HOLD, TB-XOX acid techno duo, ANTACID, funky modular performer, NORMALIEN and cinematic modular artist, NATHAN MOODY. ​1981 Vectrex console graphics performed by SineBrave and Maxwell-controlled laser performed by Danny Kim. The event will be at ANNO DOMINI GALLERY is at 366 S. 1st St. in Downtown San Jose from 7pm until 11pm, with performances starting at approximately 8:00pm. This event is free. Beer and wine will be available at the gallery. A variety of dining options are available nearby, and next door at Cafe Stritch. Live at Binary Society 05 2016.08.28 from Noise Jockey on Vimeo.